The First Polar Airlift Squadron (1st PAS) has a long and storied history. Based at the North Pole the 1st PAS is best known for providing airlift for Santa Claus during his annual, global, nocturnal delivery using venerable, reliable air-mobile RT-1 Reindeer (aka Caribou – Rangifer tarandus) generally deployed in teams of eight. For operations during inclement weather the squadron maintains one Reindeer equipped with a “RUDOLPH” enhanced red navigation lighting system. For heavylift missions at other times of the year the 1st PAS also maintains a fleet of air-mobile A-1 Moose (Alces alces), one of which was featured earlier on this blog. There are some who think I make these things up. The squadron did ask me to design the patch, so, in a sense, I did make it up. However the idea that the 1st PAS does not exist is just not true. Here’s a photo of Santa Claus on a training flight over Greenland , in the training sleigh “ICEBAT -1,” which was forwarded to me by the squadron public information officer. It is even signed by the jolly, old elf himself. What better proof could there be that the 1st PAS exists? The subdued version of the squadron patch can be seen on the left side of the sleigh. Not only can the unit insignia be seen, but, as Santa takes flight safety very seriously, you can see that both he and the elf in the back seat are wearing flight helmets. You might also note that Santa is not wearing the traditional red suit. Instead he is wearing caribou fur (the reindeer need not be made aware of that) as it is much warmer than the red getup and does not require multiple layers of thermal underwear. A bit of dark humor this time – a label from a bottle of Mr. Molotov’s Pale Ale brewed by mythical High Octane Brewing Company. 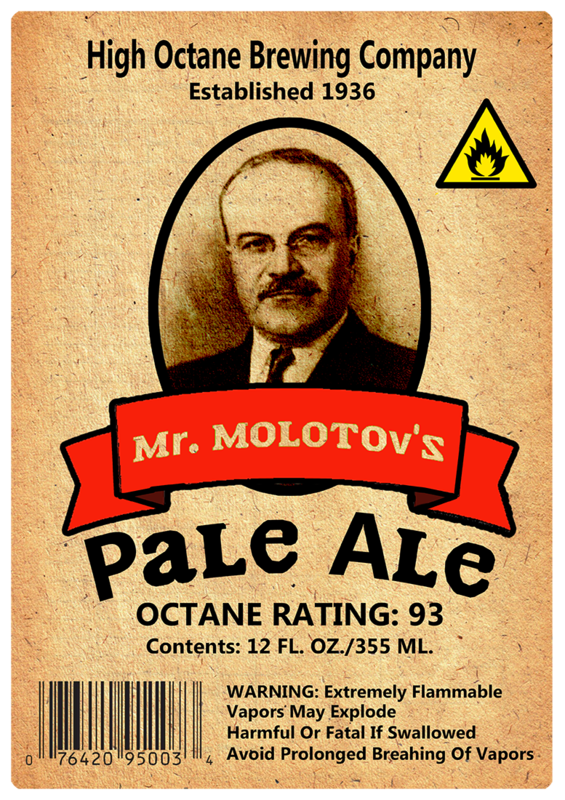 Mr. Molotov’s Pale Ale[/caption]Vyacheslav Mikhailovich Molotov was Soviet Minister of Foreign Affairs under Josef Stalin. Along with text reading “Mr. MOLOTOV’S Pale Ale” and “OCTANE RATING: 93.” Additional includes health warnings and the name of the brewery. Customizable text reading “Toss ‘Em A Molly” also appears. 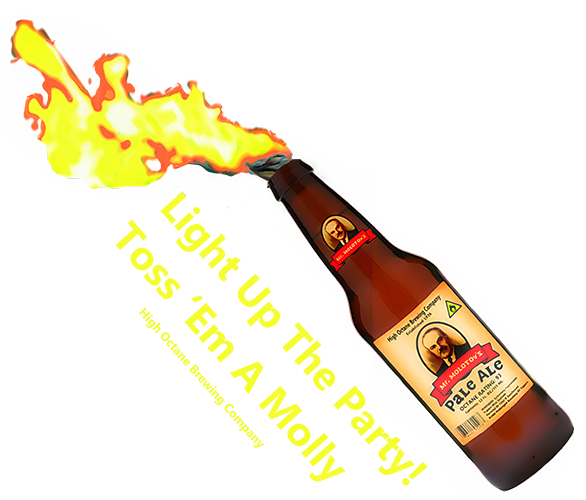 I often refer to Molotov cocktails as Mr. Molotov’s Pale Ale. The Molotov Cocktail (Russian: Коктейль Молотова) is an improvised incendiary device, usually a gasoline-filled bottle. As they are extremely easy to make they are often used in riots, by street gangs, and by guerrilla fighters. The idea is to set the target ablaze, as opposed to blowing it up with explosives. While most probably first used during the Spanish civil war in the 1930’s, the term “Molotov Cocktail” was coined by the Finns, as a jibe against Molotov, during the Winter War (1939-40) following a Russian invasion. Molotov claimed on Soviet radio that the bombs the Russians were dropping on Finland were actually humanitarian food deliveries for the starving Finns. The FInns referred to Soviet cluster bombs as “Molotov bread baskets.” Later, the Finns called gasoline incendiary devices used against Soviet tanks “Molotov cocktails,” a beverage to accompany the bread. Minister Molotov did not much care for the term. Light up the party; toss ’em a Molly. Please do not try this at home or on the street. Leave it to the professional radical; especially as most people make a critical mistake when constructing Molotov cocktails and are more likely to immolate themselves than their intended target. I enjoyed making this project as it required thinking about both artistic and technical elements. Making the label itself was quite fun, and then so was rendering a 3D bottle with the label image correctly sized and oriented in DAZ Bryce. I think I was fairly successful in giving the label the look of second-rate, poor quality which was typical of many items printed in the Soviet Union. Of course, the bush pilots at Flying Moose Aviation have their own, specially-designed, pilot’s wings featuring Milton, the Flying Moose, wearing a leather aviator’s helmet and goggles. Reindeer (Caribou), Rangifer tarandus, may suffice for once-yearly, late-December deliveries, but when you need a heavy lift capability nothing beats the Flying Moose, Alces volanti. Not only is the Flying Moose able to lift a much heavier payload than is the Reindeer, but its wings allow for greater precision when landing as well as hovering capability. 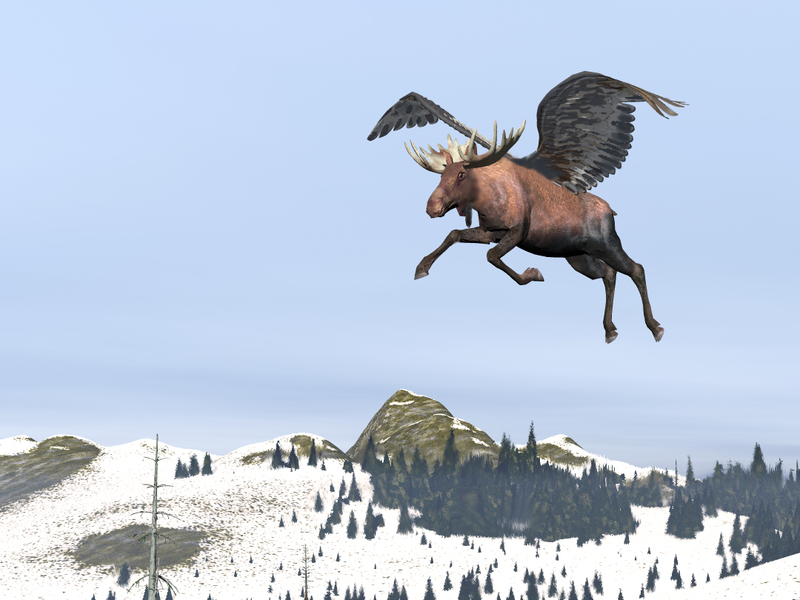 A wild Flying Moose, sighted somewhere over British Columbia, is pictured below. 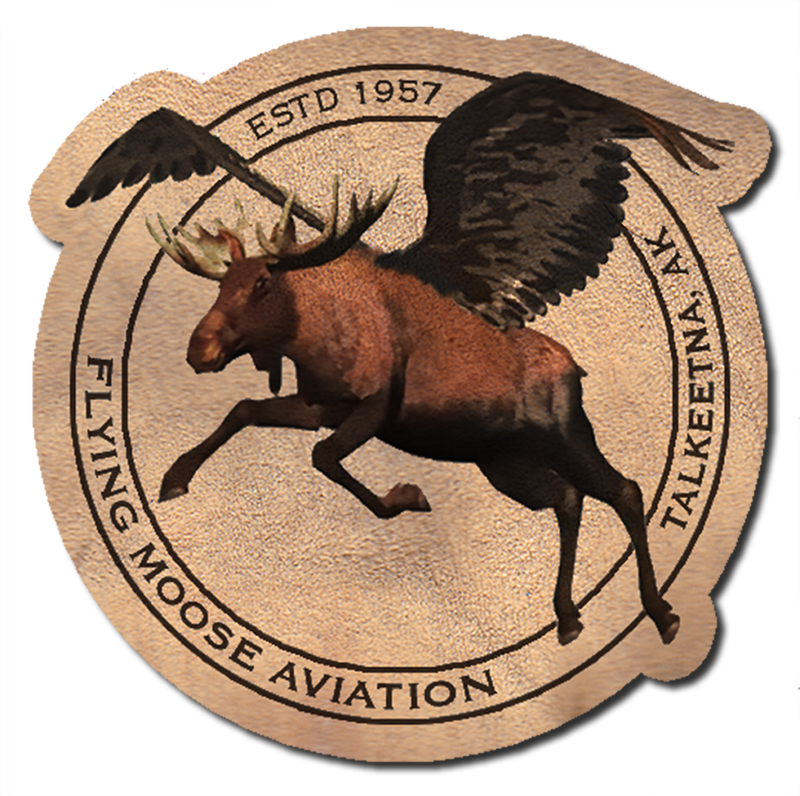 The Flying Moose has been adopted by at least one mythical, all-purpose flying service in Talkeetna Alaska – Flying Moose Aviation (FMA). FMA’s motto is “Flightseeing, glacier landings, cargo, hunting and fishing charters. We fly; tell us where you want to go.” A leather patch, as worn by FMA bush pilots on their jackets, is below. 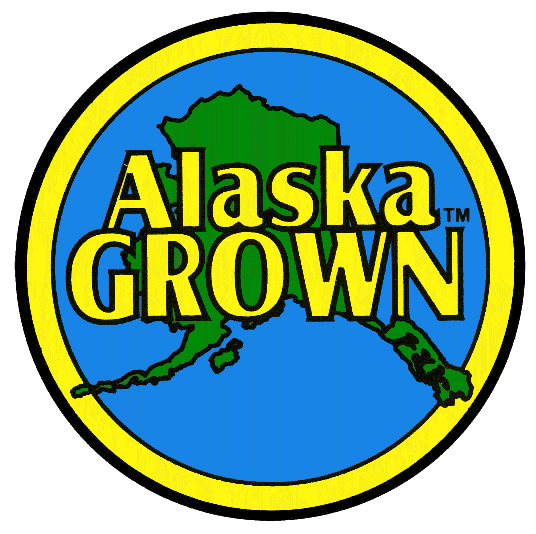 A parody of the well known "Alaska Grown" logo. It can get rather chilly in Alaska. At one time I lived where the temperature on winter nights regularly got down below minus sixty. 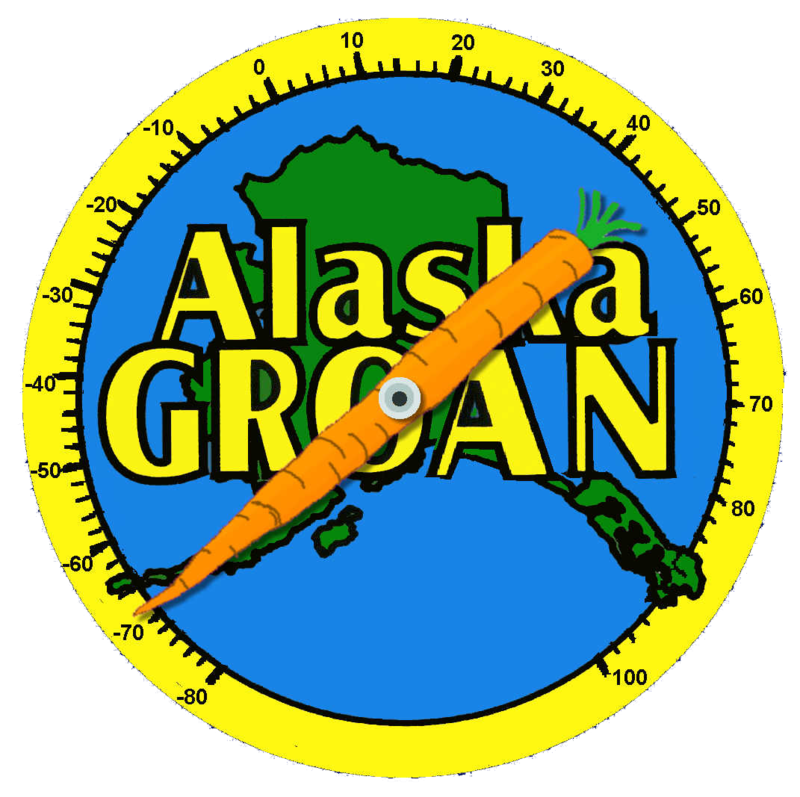 The Alaska Grown logo serves to increase consumer awareness and consumption of Alaska agricultural products. I highly recommend you try Alaska-grown products whenever possible. The long days of summer can make for some very healthy vegetables including carrots as sweet as candy. 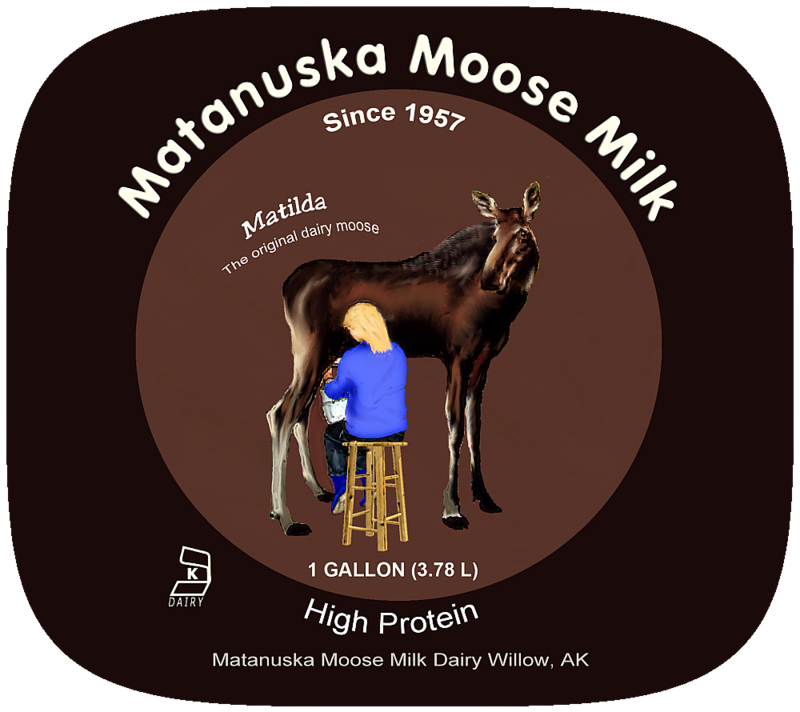 An old sign from world famous and entirely mythical Matanuska Moose Milk dairy farm in Willow Alaska; not too far from Anchorage. 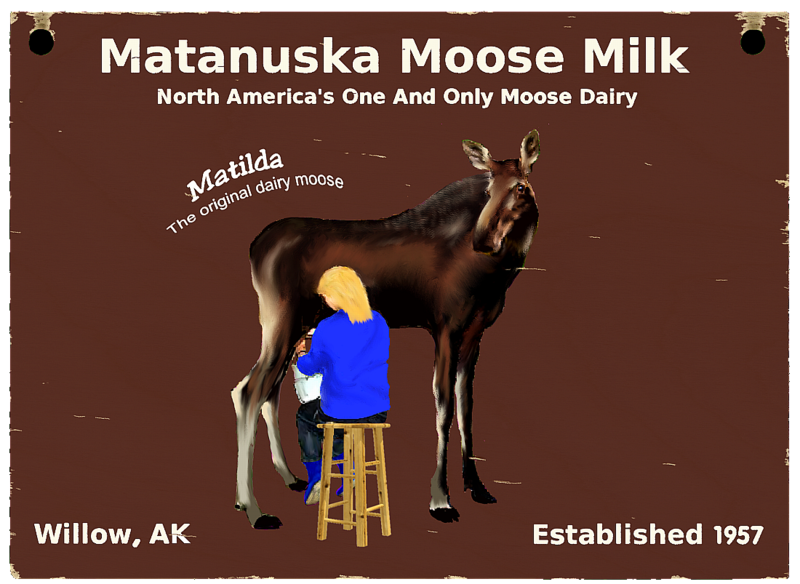 In the image a milkmaid can be seen hand milking Matilda the farm’s first dairy moose. This is North America’s first and only moose dairy. When they make Moose Tracks ice cream, it’s the real thing; and the moosarella cheese makes great pizza. Believe it or not there are moose dairies; a small number in Russia and one in Sweden. Moose milk is commercially farmed in Russia. 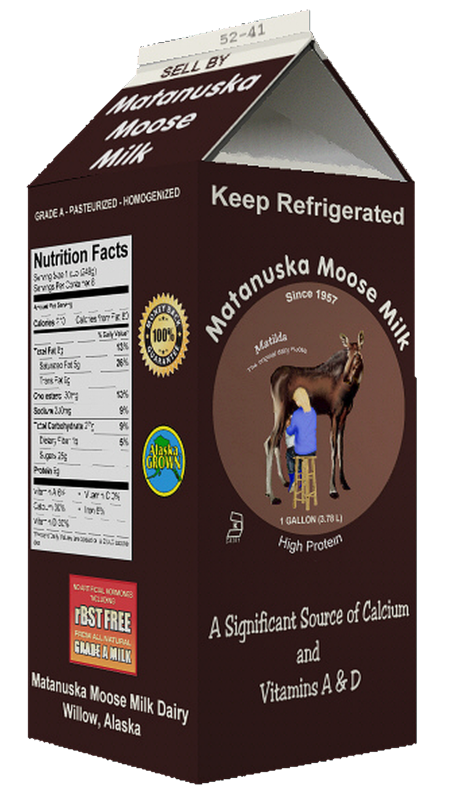 The milk is high in butterfat (10%) and solids (21.5%), according to data collected on Russian moose; research into American moose milk is in a less advanced state than in Russia, but appears to indicate that American moose have even higher concentrations of solids in their milk. Moose milk is said to be a bit salty and bitter; with a hint of pine or spruce needles. A farm-born moose calf is taken from its mother within 2–3 hours after birth and is raised by people. It is first bottle-fed pure moose milk for about a week, but then it is diluted and gradually replaced with a milk substitute. The calves imprint and become attached to humans. The Russians say moose soon recognize the milkmaids as their substitute as her substitute calves. Milkmaids spread amniotic fluid on their hands to further this process. Having become accustomed to humans the animals are released to the forest; but visit the farm every day to be milked during the lactation period (typically, until September or October). Some animals become more attached to the farm than do others. The Russians hope that after several generations they will see the development of domesticated moose. This effort is hampered by the fact that in the free-range conditions farm moose cows often mate with wild bulls. During winter the animals roam free throughout the surrounding forest. They usually do not stray too far, but spend much of their time at nearby woodlots where trees are being cut, feeding on the by-products of timber operations. And they know the farm as the place for a daily rations of oatmeal, and as a safe place to give birth to their young. One Russian sanitorium serves moose milk to residents in the belief that it helps them recover from disease or manage chronic illness more effectively. Some Russian researchers have recommended that moose milk could be used for the prevention of gastro-enterological diseases in children. Kostroma Moose Farm began operations in 1963 under the aegis of Kostroma Oblast Agricultural Research Station which established a moose husbandry laboratory coordinate research conducted at the farm, both by Kostroma zoologists and scientists from Moscow and elsewhere. Kostroma lies at the confluence of the Volga and Kostroma rivers; approximately 200 miles northwest of Moscow. In addition to milk the Kostroma farm engages in the harvest of antler velvet. A bull moose grows a new pair of antlers every summer. Similar to the deer and reindeer (caribou) farms in New Zealand and Siberia, moose antlers can be harvested while they are still soft and covered with velvet, which is used for the manufacture of certain pharmaceutical products. Tourists may also visit the farm. Though access to the farm is strictly controlled to protect the animals from disease. Visit to the facility can be arranged through the Kostroma Tourism Bureau. Two other Russian farms, intending to raise moose for meat failed after a short time. Meat sales did not cover the costs of production which can be as much as ten times higher than for beef. And moose are not stupid. They soon stop returning to a place of slaughter. The Elk (Moose are called Elk in Europe) House (Älgens Hus) farm in Bjurholm, Sweden is believed to be the world’s only producer of moose cheese. The cheese sells for about 500 dollars per pound. Algens Hus’ restaurant offers moose-cheese dishes. Cheese plain with bread or biscuits, or better yet, frozen moose mousse. Best served with raspberries. I would like to announce the discovery of a new species of moose. 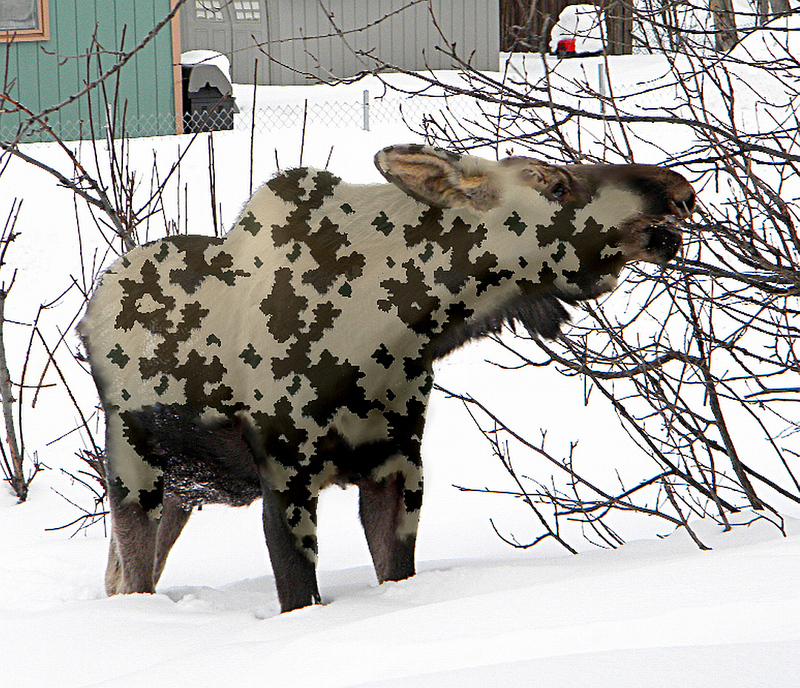 Tentatively dubbed Alces absonditus (Hidden Moose) by the scientific community, the Camouflage Moose has caused a level of excitement not seen since the Panda was introduced to the West. For now biologists are keeping the area where several “Camoose” have been sighted a secret in order to protect the animals. But I received this photo from a confidential source. I have several conventional/traditional projects under way which will appear here in the future, but I just wanted to post one more version of the Sasquatch image from some weeks ago. 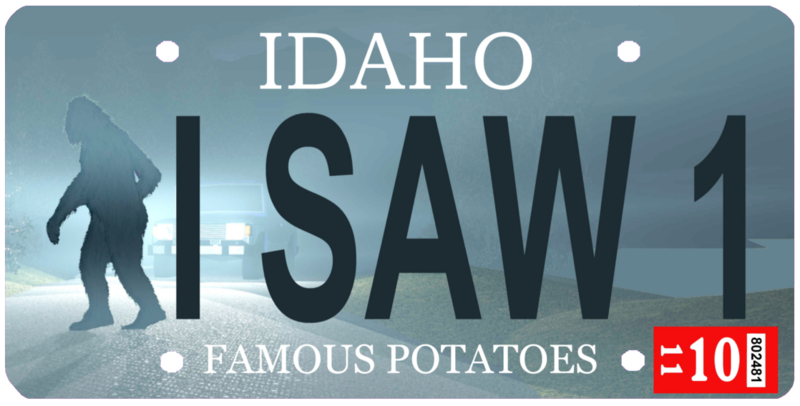 Idaho’s standard license plate was voted “Most Beautiful” of the 50 states, or something like that, a few years ago. There are also a number of plates promoting wildlife conservation which are quite nicely done. Ya’ think I should cointact the DMV and try to hock this one? As with most of the images appearing here this one is available at my Zazzle store.